Sam vs. Lupus: Lupus Chic, Part 1: Why it Matters. Lupus Chic, Part 1: Why it Matters. I have been requested by a number of fellow lupus patients to write about the ways in which lupus, or the drugs used to treat it, change our appearance. As soon as I started writing, however, I realized that there was absolutely no way I could fit even the most common changes into one article. I therefore plan to write a series of posts on the subject of lupus and physical appearance. But before going into the specifics of various changes, I think it’s important to explain why this topic is so important to those of us fighting this wretched disease. Lupus patients’ concern with visible manifestations of our disease is not simply vanity run amok, nor is it a sign that our priorities are screwed up. Physical changes wrought by lupus/lupus treatments are visible signs that we lupies are no longer healthy, normal people. Every time we look in a mirror, we see a sick person. The changes are constant, incessant reminders that we no longer retain the illusion of control. They also allow break-downs in social barriers that normally protect people (to a limited extent) from over-inquisitive strangers. Generally some random guy on a bus will not ask you about your kidney function. (Yes, I take public transportation, and yes, there are crazy people who will talk to you about anything and everything. But I like to think that such overtly crazy people are a small minority). However, if you have a bright pink rash across your face, the same guy won’t think twice before asking about it. So the physical manifestations of lupus remind us that we’re sick, and then people continually make sure we don’t forget it. 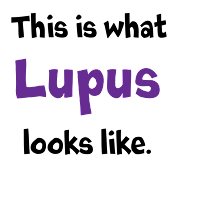 A serious problem experienced by lupus patients is the fact that, while a physical change caused by lupus/lupus treatments may be visible, the reason behind that change may not be. Other people will draw erroneous conclusions about the lupus patient, which can be insulting, hurtful, and frustrating. Nowhere is this more clearly played out than in the case of weight gain caused by prednisone. High doses of prednisone will almost invariably cause a patient to gain weight. This is not because the patient is lazy, eats only Big Macs, or doesn’t try to keep in shape. Prednisone (and related corticosteroid therapies) reaches into the body and flips on the “you’re hungry, eat NOW!” switch. Unfortunately, being overweight is stigmatized in today’s world, and most people don’t bother to find out why someone is overweight before making patronizing, catty or truly vicious comments. Such comments are simply added insult to an already terrible illness. One of the hardest aspects of lupus for me to cope with is the lack of control I have over my health and/or appearance. I am someone who wants things to be organized, controlled, and planned in advance. I like to look well put together. I find it stressful if my shoes clash with my outfit. I am, in short, a Type A personality. It drives my parents nuts. Unfortunately, as a therapist once pointed out, I picked the wrong disease for my personality. Lupus is an unpredictable disease. It flares up at random intervals, and a person can literally go from feeling fine to being in the hospital overnight. The visible symptoms of lupus are, unsurprisingly, equally unpredictable. Visible signs of lupus serve as constant reminders to lupus patients that we have very little control over our lives. If the signs are very noticeable, we no longer even retain control over who knows that we’re sick; anyone who sees us will immediately know that something is wrong. The fact that we have little control over our lives is something that is very, very difficult to accept. The constant reminders don’t help. What healthy people consistently fail to understand about lupus is that it permeates every aspect of a patient’s life. This is not hyperbole; there is literally no area of life that remains untouched by lupus. And, of course, the physical manifestations of our disease are constant reminders that we’re different, that we’re sick, we have no control, and that we aren’t “just getting better.” Is it really any wonder that we find the visible changes wrought by our disease to be painful and stressful? I have been asked to write about physical changes caused by lupus, and those caused by prednisone. I plan to write full articles on each of these topics. If people have other suggestions/requests I’d love to hear them. Dear Lupus Chick, I became a follower of your blog after yours came up after a blogger search. I just started my own blogger, I have MCTD. HUGE FLARE happening for months now. Since I just started my blog last night there's not much in there yet. I was too busy using my techie skills and modifying the HTML .....figuring out if I wanted a fish tank gadget on my page ... lol, nixed that. I haven't read yours yet either. I randomly went to the start of this year and found that your story might be starting there? I'm anxious to read your lupus "adventures". I'll be putting mine up in bits and pieces ...I'll need to remember to label my posts properly. http://annehasablog.blogspot.com/ and after it has something worthwhile to read, feel free to drop in. I just wanted to add -- I can SOOO identify with your paragraph starting with " One of the hardest aspects of lupus for me to cope with is the lack of control I have over my health and/or appearance. ....I like to look well put together. " My fatigue is so bad now I don't care as much. Which is very sad, I used to be the person making sure every strand of my hair was perfectly in place, but now, alot of my hair just fell out. Not due to meds, due to disease. No bald spots, but it's hard to manage. I hear you on the hairloss thing. Last year it was driving me to tears on a regular basis... I couldn't cope with the fact that I wasn't able to hide my illness and that I looked horrible. So I cut my hair off and my parents kindly bought me a wig (of my choosing) for Christmas. Best decision ever for me. I know that doesn't work for everyone, but for me it made a huge difference to be in control of at least one part of my appearance! Thank you very much; that's very kind of you. I've literally spent over ten years in college/grad school at this point, and I absolutely love to hear that the science/writing skills I've learned are helpful for other people. I am planning to do more posts on this subject, but off the top of my head here are a couple thoughts: Before switching to a wig, I used to wear a lot of hats. I tried to find cute hats that I could wear all day. I also wore thick headbands, which helped hide the thinning. In terms of make-up, I buy Physician's Formula foundation because it has SPF50 sunblock in it. That's a high enough SPF to make it so I don't have to put on sunblock on my face everyday in addition to my makeup. I'm so photosensitive that I've got to wear some kind of sunblock even if I'll only be out for five minutes, but I've had good luck with the physician's formula stuff. I think Neutragena also has some SPF 50 or 55. I'm glad you like the recipes, too! I have to bring cookies to work when I make them because otherwise I'll eat the whole batch myself!